The ALUS Lambton program started up in 2015, in a partnership with Ontario Nativescape, a division of the Rural Lambton Stewardship Network. The ALUS Lambton program started up in 2015, in a partnership with Ontario Nativescape, a division of the Rural Lambton Stewardship Network. This not-for-profit organization is focused on promoting native Prairie, a special mixture of perennial native plants providing habitat for our native pollinators. ALUS Lambton PAC 2018, from left to right: Joe Kerr, Rob Buchanan, Ian Grant, Jake Lozon, Doug McGee (PAC Chair), Donald Craig, Daryl Randall, Mary Ellen King, Tim Payne, Lindsay Buchanan (Program Coordinator). ALUS Canada and MPP Toby Barrett hosted a special reception at Queen’s Park on March 2019 in support of ALUS in Ontario. 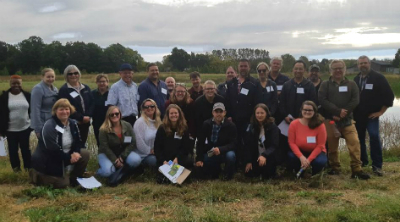 ALUS Lambton participants Scott and Susan Stephens maintain eight ALUS projects on environmentally sensitive parcels of land on Meadowlea Farms. ALUS works closely with many organizations across Canada. In September, 2018, we celebrated collaboration in Ontario. Congratulations to Dr. Wanhong Yang, recipient of the 2018 Weston Family Ecosystem Innovation Award.